Despite advancements in treatments for acute coronary syndromes over the last 10 years, they continue to be life-threatening disorders. Currently, the standard of treatment includes dual antiplatelet therapy consisting of aspirin plus a P2Y12 receptor antagonist. The thienopyridine class of P2Y12 receptor antagonists, clopidogrel and prasugrel, have demonstrated efficacy. However, their use is associated with several limitations, including the need for metabolic activation and irreversible P2Y12 receptor binding causing prolonged recovery of platelet function. In addition, response to clopidogrel is variable and efficacy is reduced in patients with certain genotypes. Although prasugrel is a more consistent inhibitor of platelet aggregation than clopidogrel, it is associated with an increased risk of life-threatening and fatal bleeding. Ticagrelor is an oral antiplatelet agent of the cyclopentyltriazolopyrimidine class and also acts through the P2Y12 receptor. In contrast to clopidogrel and prasugrel, ticagrelor does not require metabolic activation and binds rapidly and reversibly to the P2Y12 receptor. In light of new data, this review provides an update on the pharmacokinetic, pharmacodynamic and pharmacogenetic profiles of ticagrelor in different study populations. Recent studies report that no dose adjustment for ticagrelor is required on the basis of age, gender, ethnicity, severe renal impairment or mild hepatic impairment. The non-P2Y12 actions of ticagrelor are reviewed, showing indirect positive effects on cellular adenosine concentration and biological activity, by inhibition of equilibrative nucleoside transporter-1 independently of the P2Y12 receptor. CYP2C19 and ABCB1 genotypes do not appear to influence ticagrelor pharmacodynamics. A summary of drug interactions is also presented. Dual antiplatelet therapy with aspirin and a P2Y12 receptor inhibitor represents the standard of care treatment for the management of patients with acute coronary syndrome. Ticagrelor is the first of a new class of P2Y12 receptor inhibitors, which is distinct from clopidogrel and prasugrel with respect to its unique mode of action. This article provides a comprehensive overview of the pharmacokinetic, pharmacodynamic and pharmacogenetic profiles of ticagrelor in different study populations—updating a previous review on this topic. Acute coronary syndromes (ACS) encompass a spectrum of unstable coronary artery disease (CAD), involving an abrupt reduction in coronary blood flow leading to myocardial ischaemia and/or myocardial infarction (MI) with or without ST-segment elevation . Associated with significant morbidity and mortality , the pathophysiology of the majority of these life-threatening conditions involves the rupture of an atherosclerotic plaque within a coronary artery and subsequent platelet activation, aggregation and thrombus formation . Myocardial injury can also occur through increased oxygen demand (e.g. stenosis) or via non-atherothrombotic coronary obstruction (e.g. arteriospasm) . If untreated, decreased blood flow and decreased perfusion of the myocardium can lead to myocardial necrosis . Dual antiplatelet therapy represents the cornerstone of treatment for ACS. Guidelines recommend aspirin plus a P2Y12 receptor antagonist, with selection of the P2Y12 inhibitor dependent on individual patient characteristics, such as advanced age, and concomitant use of immunosuppressant agents [1, 5, 6, 7]. The two classes of P2Y12 receptor antagonist currently available for antiplatelet therapy are thienopyridines (clopidogrel and prasugrel) and, more recently, the cyclopentyltriazolopyrimidines (ticagrelor). Although widely available in generic form, and previously considered standard therapy for ACS , clopidogrel is associated with a number of limitations, including a delayed onset of action due to the need for metabolic activation, prolonged recovery of platelet function due to irreversible P2Y12 platelet binding, and variable and reduced antiplatelet effects in patients with certain genotypes, which may be related to genetic variations in the enzymes responsible for clopidogrel metabolic activation [9, 10, 11]. Like clopidogrel, prasugrel requires metabolic activation for antiplatelet activity and binds irreversibly . The antiplatelet response to prasugrel appears to be more potent and consistent compared with the response to clopidogrel. However, as shown in TRITON-TIMI 38 (Trial to Assess Improvement in Therapeutic Outcomes by Optimizing Platelet Inhibition with Prasugrel–Thrombolysis in Myocardial Infarction 38), these positive effects are accompanied by an increase in the rate of major bleeding . The P2Y12 receptor antagonist ticagrelor has a unique mode of action . Ticagrelor does not require metabolic activation for antiplatelet activity and binds reversibly to the P2Y12 receptor. In the PLATO (Platelet Inhibition and Patient Outcomes) study, ticagrelor significantly reduced the incidence of the composite end point of cardiovascular death, MI or stroke in patients with ACS, compared with clopidogrel . There were no significant differences in overall major bleeding rates between treatments, although a significantly higher rate of major bleeding not related to coronary artery bypass grafting (CABG) was seen with ticagrelor versus clopidogrel . The prospective PEGASUS-TIMI 54 study showed that long-term therapy with ticagrelor and low-dose aspirin in patients with a prior MI (>12 months previously) significantly reduced the incidence of the primary efficacy end point (a composite of cardiovascular death, MI or stroke), with an increase in major bleeding versus placebo . Assessing the pharmacological profile of oral antiplatelet agents is critical for the appropriate selection of an antiplatelet agent and/or regimen, particularly given the broad patient population with ACS, with the potential range of comorbidities [6, 7]. This article provides a comprehensive summary of the pharmacokinetic, pharmacodynamic and pharmacogenetic profiles of ticagrelor, updating an earlier review on this topic . The pharmacokinetic profile of ticagrelor has been evaluated in healthy volunteers and in patients with CAD, atherosclerosis and ACS. A regional absorption study in healthy volunteers showed that the proportion of ticagrelor that was absorbed decreased the further down the gastrointestinal tract that the dose was released . In healthy volunteers, single oral doses of ticagrelor 0.1–400 mg were rapidly absorbed, with a median time to reach the maximum plasma concentration (t max) of approximately 1.3–2 h. Similarly, the median t max for AR-C124910XX (the active metabolite of ticagrelor) was 1.5–3 h [19, 20]. Alternative methods of administration have been shown to increase the rate of absorption of ticagrelor. In healthy volunteers, administration of ticagrelor as a crushed tablet (dosed orally or via a nasogastric tube) increased plasma concentrations of ticagrelor and AR-C124910XX at early time points (0.5 and 1 h post-dose) relative to oral administration of a whole tablet. The ticagrelor t max was shorter following crushed versus whole tablet administration (1 vs 2 h) (Fig. 1) . Further studies are warranted to assess whether administration of crushed tablets provides a pharmacodynamic or clinical benefit in scenarios in which the absorption of ticagrelor occurs less rapidly than predicted, e.g. in patients with ACS, in whom t max values of 3 and 4 h have been reported for ticagrelor and AR-C124910XX, respectively, following a 180 mg loading dose . The mean absolute bioavailability of ticagrelor in healthy volunteers is 36 % . Mean and maximum plasma concentration (C max) values of ticagrelor and AR-C124910XX increase linearly and predictably in a dose-dependent manner and are stable at steady state in healthy volunteers  and in patients with atherosclerosis , CAD  and ACS . The effect of food on exposure to ticagrelor and AR-C124910XX is small and considered to be of minimal clinical significance. Therefore, ticagrelor can be administered with or without food . In vitro studies evaluating the metabolism of ticagrelor have been conducted in hepatocyte and microsomal preparations from several animal species . Multiple metabolites were identified and the major metabolites across all species were AR-C124910XX and AR-C133913XX. Cytochrome P450 (CYP) 3A4 and CYP3A5 were primarily responsible for the formation of AR-C124910XX, whereas the formation of AR-C133913XX most likely occurred via CYP3A4, with a lesser contribution from CYP3A5 . 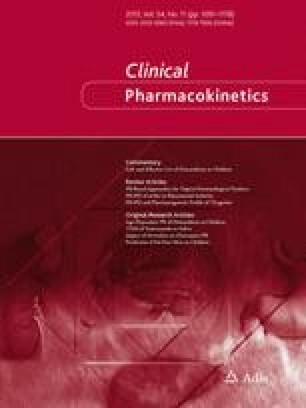 Consequently, potential interactions between ticagrelor and inducers or inhibitors of CYP3A4 were evaluated in clinical pharmacology studies and are discussed in greater detail in the ‘Drug Interactions’ section. Experiments conducted with radiolabelled ticagrelor in six healthy male volunteers identified ten discrete metabolites, with unchanged ticagrelor and AR-C124910XX being the predominant entities observed in the plasma. AR-C124910XX is present at approximately 30–40 % of the concentration of the parent compound [20, 24]. Following administration of [14C]-ticagrelor, 58 % was recovered in the faeces and 27 % in the urine; the levels of unchanged ticagrelor and AR-C124910XX in the urine were <0.05 % . These data indicate that ticagrelor is mainly excreted in the faeces, with renal excretion playing only a minor role; the primary route of excretion for the active metabolite is most likely biliary secretion. The mean elimination half-life of ticagrelor is 7.7–13.1 h, whereas the mean elimination half-life of AR-C124910XX is 7.5–12.4 h . Table 1 summarizes the key pharmacokinetic parameters of ticagrelor alongside clopidogrel and prasugrel. In 40 healthy volunteers who received ticagrelor 200 mg, systemic exposure to ticagrelor and AR-C124910XX was approximately 40–60 % higher in elderly versus young subjects and in women versus men. However, no dose adjustment is considered necessary on the basis of either age or gender ; nor is dose adjustment required in patients with severe renal impairment  or mild hepatic impairment . The use of ticagrelor is contraindicated in patients with severe hepatic impairment . As ticagrelor metabolism occurs in the liver [27, 28], exposure to the parent drug will probably increase in severe hepatic impairment . In addition, the bleeding risk is increased in severe hepatic impairment because of reduced synthesis of coagulation proteins . No pharmacokinetic data are available in patients with moderate hepatic impairment (need to consider the risk–benefit of ticagrelor due to probable increase in exposure ) or patients receiving renal dialysis. In PLATO, the incidence of dyspnoea was higher with ticagrelor compared with clopidogrel [15, 29]. Ticagrelor inhibits platelet activity via P2Y12 receptor inhibition and also via adenosine . A potential mechanism of ticagrelor-induced dyspnoea involves increased endogenous levels of adenosine . Adenosine can induce dyspnoea in normal  and asthmatic  subjects. Thus, two randomized, double-blind, placebo-controlled, two-way crossover studies were conducted to evaluate the pharmacokinetics, pharmacodynamics and safety of ticagrelor in subjects at risk of respiratory impairment (healthy elderly) and in patients with respiratory impairment (mild asthma or mild to moderate chronic obstructive pulmonary disease [COPD]) . Although exposure to ticagrelor (at steady state) and AR-C124910XX (after a single dose of ticagrelor and at steady state) appeared to be lower in patients with asthma or COPD compared with healthy elderly volunteers, no consistent relationship was observed between exposure and minute ventilation, respiratory rate, tidal volume, spirometry, pulse oximetry or dyspnoea. Furthermore, ticagrelor did not appear to alter pulmonary function at rest or during exercise; bronchospasm (as determined by spirometry and pulse oximetry) was not observed in any cohort . Additionally, diabetic status appears to have no significant effect on ticagrelor pharmacokinetics (AstraZeneca, data on file) . The pharmacokinetics of ticagrelor have also been assessed in several different ethnic groups. Ticagrelor and AR-C124910XX exhibited linear and predictable pharmacokinetics in healthy Chinese volunteers at doses of 90 and 180 mg . Exposures to ticagrelor and AR-C124910XX at steady state were slightly higher in Chinese volunteers compared with Caucasian volunteers in other studies [19, 20]. The pharmacokinetics of ticagrelor and AR-C124910XX in Japanese volunteers were assessed in two ethnicity-bridging studies. Pharmacokinetic profiles were broadly comparable between Japanese and Caucasian volunteers following single ascending doses (50–600 mg) and multiple ascending doses (100 or 300 mg) of ticagrelor . After adjustments to account for differences in body weight between the ethnic groups, exposure to ticagrelor and AR-C124910XX was approximately 20 % greater in Japanese versus Caucasian participants . These findings were consistent with observations in a similar study of Japanese patients with CAD . In DISPERSE (Dose Confirmation Study Assessing Anti-Platelet Effects of AZD6140 vs Clopidogrel in Non-ST-segment Elevation Myocardial Infarction), after treatment with ticagrelor (45 or 90 mg twice daily) for 28 days, the area under the plasma concentration–time curve (AUCτ) and C max of ticagrelor and AR-C124910XX were 1.3- to 1.5-fold greater in Japanese patients than in Caucasian patients (Fig. 2) [24, 43]. The observed differences in exposure to ticagrelor in Chinese and Japanese versus Caucasian patients are not of sufficient magnitude to warrant dose adjustment on the basis of ethnicity. Two randomized, open-label, crossover studies evaluated the pharmacokinetic parameters of ticagrelor in Hispanic and African-American patients with CAD [44, 45]. Ticagrelor and AR-C124910XX exhibited similar exposure in Hispanic and African-American patients compared with those previously reported in Caucasian patients [25, 44, 45]. In vitro experiments using human liver microsomes indicate that ticagrelor and AR-C124910XX are predominantly metabolized by CYP3A4 and, less so, by CYP3A5 enzymes [20, 28]. Metabolism studies demonstrate that, in addition to being a CYP3A substrate, ticagrelor is a weak inhibitor or activator of CYP3A . Ticagrelor and AR-C124910XX appear to have low or no potential to induce CYP1A1, CYP1A2, CYP2C9, CYP2B6 and CYP3A4, and no propensity to inhibit CYP1A2, CYP2B6, CYP2C8, CYP2C19, CYP2D6 and CYP2E1. Unpublished in vitro studies also indicate that ticagrelor is a substrate and inhibitor of P-glycoprotein (P-gp) . The interaction of ticagrelor and the probe CYP3A substrate midazolam was evaluated in healthy volunteers in two clinical pharmacology studies  and confirmed earlier unpublished in vitro findings that ticagrelor is a weak inhibitor of CYP3A. Thus, co-administration of ticagrelor with CYP3A substrates that have a narrow therapeutic profile (e.g. ergot alkaloids, cisapride) should be avoided . Statin compounds are also substrates of CYP3A and concomitant administration with antiplatelet agents is common in patients with ACS (90 % of patients receiving ticagrelor in the PLATO study received concomitant statins with no safety concerns) . Two separate crossover studies evaluated the interaction between ticagrelor (loading dose 270 mg; 180 mg twice daily, 7 days) and atorvastatin (80 mg) or simvastatin (80 mg) . Co-administration with ticagrelor increased the atorvastatin C max by 23 % and AUC by 36 %. These increases in C max were modest and considered not to be clinically significant. However, the magnitude of the interaction between ticagrelor and simvastatin was greater. The mean simvastatin C max and AUC increased by 81 and 56 %, respectively, in the presence of ticagrelor and, in some individuals, 2- to 3-fold increases in the simvastatin AUC were observed. Although the dose of ticagrelor used in these studies was greater than the clinically approved regimen, it is recommended that the concomitant use of simvastatin or lovastatin at doses greater than 40 mg should be avoided with ticagrelor, as patients may be at increased risk of statin-related adverse effects [29, 47]. CYP isoenzymes, including 3A4, also play a role in the oxidative metabolism of ethinyl oestradiol and the hydroxylation of levonorgestrel. As it is common for combinations of these compounds to be used in widely dispensed oral contraceptives, potential interactions with ticagrelor were assessed in young, healthy women (mean [standard deviation] age 32.7 [7.1] years) . Co-administration of ticagrelor had no significant effects on the pharmacokinetics of ethinyl oestradiol or levonorgestrel; thus, no clinically relevant effect of ticagrelor on oral contraceptive efficacy or safety is expected . One of the most abundant hepatic CYP enzymes involved in the absorption, distribution, metabolism and excretion of ticagrelor is CYP2C9. No interaction between ticagrelor and the model CYP2C9 substrate tolbutamide was observed in healthy volunteers . Thus, ticagrelor is unlikely to affect CYP2C9-mediated metabolism of other drugs and vice versa. As such, a recent European Society of Cardiology expert position paper concluded that proton pump inhibitors (which are predominantly metabolized by CYP2C enzymes) are unlikely to have any significant pharmacokinetic interaction with ticagrelor . Similarly, ticagrelor is not expected to affect CYP2D6-mediated drug metabolism to a clinically relevant extent. In healthy volunteers, co-administration of ticagrelor with the CYP2D6 substrate venlafaxine resulted in only a small (22 %) increase in the venlafaxine C max and no significant increase in the venlafaxine AUC . In addition to the CYP enzymes, various transporter proteins also play a role in the absorption, distribution, metabolism and excretion of drugs. As suggested by unpublished in vitro studies, ticagrelor is a weak inhibitor of P-gp. Concomitant use of ticagrelor and digoxin increased exposure to digoxin (C max by 75 %, AUC by 28 %) . Therefore, appropriate clinical and/or laboratory monitoring is recommended when ticagrelor is administered with P-gp-dependent drugs possessing a narrow therapeutic profile (e.g. digoxin). Ticagrelor is a substrate of CYP3A and the use of ticagrelor with strong CYP3A4 inhibitors or potent CYP3A inducers was thus an exclusion criterion in the PLATO study . Concomitant administration of strong CYP3A inducers (e.g. rifampicin) decreases exposure to ticagrelor. For example, co-administration of ticagrelor and rifampicin significantly reduced the C max, AUC and plasma half-life of ticagrelor by 73, 86 and 67 %, respectively . Conversely, strong CYP3A4 inhibitors (e.g. ketoconazole, ritonavir) or moderate CYP3A4 inhibitors (e.g. diltiazem, fluconazole, grapefruit juice) increase exposure to ticagrelor. For example, in healthy volunteers, grapefruit juice increased the ticagrelor C max and AUC by 165 and 221 %, respectively . Moreover, co-administration of ketoconazole increased the ticagrelor C max and AUC by 135 and 632 %, respectively . On the basis of these findings, the use of ticagrelor with strong CYP3A4 inhibitors is contraindicated [29, 55]. Cyclosporine is a weak inhibitor of CYP3A4, as well as a potent inhibitor of P-gp. As it is possible that ticagrelor (a CYP3A4 and P-gp substrate) might be co-administered with cyclosporine in patients with ACS and comorbidities requiring immunosuppressive treatment, a crossover study was performed in healthy volunteers to evaluate potential interactions. Co-administration of ticagrelor with cyclosporine increased the ticagrelor AUC and C max by 283 and 230 %, respectively, while the pharmacokinetic profile of cyclosporine was unaffected. However, the magnitude of cyclosporine’s effect on ticagrelor pharmacokinetics was not considered sufficient to warrant dose adjustment of ticagrelor . The interaction of ticagrelor with two anticoagulants, heparin and enoxaparin, was evaluated in two studies of healthy volunteers, and no notable changes in the pharmacokinetics of ticagrelor or AR-C124910XX were reported . Furthermore, switching from clopidogrel to ticagrelor did not substantially affect the pharmacokinetic profile of ticagrelor . A summary of known ticagrelor drug interactions is provided in Table 2. The majority of ACS patients in the PLATO study were taking a range of co-administered drugs typical of this patient population . In predefined subgroups, ticagrelor significantly reduced the incidence of the primary end point (a composite of cardiovascular death, MI or stroke) compared with clopidogrel in patients taking lipid-lowering drugs, beta-blockers, angiotensin-converting enzyme inhibitors and calcium channel blockers. The incidence of the primary end point was also lower (not significant) with ticagrelor versus clopidogrel in patients taking angiotensin II receptor blockers or proton pump inhibitors. PLATO also demonstrated that ticagrelor was associated with better clinical outcomes versus clopidogrel in patients on low-dose maintenance aspirin . Consequently, aspirin doses <100 mg/day are recommended with ticagrelor . Table 1 summarizes the key pharmacodynamic parameters of ticagrelor alongside clopidogrel and prasugrel. Ticagrelor binds to P2Y12 receptors in a potent and reversible manner using a binding site distinct from the adenosine 5′-diphosphate (ADP)-binding site . Consequently, binding does not cause an ADP-induced conformational change in the P2Y12 receptor, G proteins are not activated, the receptor remains inactive and ADP signalling is inhibited . Ticagrelor binds only to the P2Y12 receptor and not to other P2Y receptor types . Unlike clopidogrel and prasugrel, ticagrelor does not require metabolic activation and its active metabolite, AR-C124910XX, is approximately equipotent to ticagrelor at the P2Y12 receptor. AR-C124910XX is also thought to contribute to the antiplatelet effect reported with ticagrelor administration . Reticulated platelets are large, young, newly formed platelets and have been shown to exhibit increased reactivity, compared with non-reticulated platelets . Platelet recovery was tested in rats receiving a single dose of ticagrelor (40 mg/kg) or clopidogrel (200 mg/kg). Ticagrelor reduced thrombus formation more effectively compared with clopidogrel . The study reported that a subpopulation of juvenile platelets, which formed at later time points, promoted thrombus formation after clopidogrel but not after ticagrelor. This suggests that, at least in rats, the recovery of platelet function after treatment with ticagrelor differs mechanistically from that after treatment with clopidogrel. The efficacy of antiplatelet therapy must be balanced with the risk of bleeding in situations such as planned or emergency surgery. The vasopressin desmopressin is often used as a first-line therapy for individuals with bleeding disorders. The effect of desmopressin on bleeding time in healthy volunteers receiving ticagrelor was tested in a randomized, double-blind, two-way crossover study . Healthy volunteers received ticagrelor (270 mg loading dose; 180 mg twice daily) for 5 days; at day 5, desmopressin (0.3 mcg/kg) or saline intravenous infusions were then administered. The study reported no significant effect of desmopressin on bleeding time or inhibition of platelet aggregation (IPA). However, primary haemostatic activity was increased . To date, no pharmacological agent has been shown to reverse the antiplatelet effect of ticagrelor. Currently, a specific antidote to ticagrelor is under development . This antidote, MEDI2452, is a highly specific neutralizing fragment antigen binding (Fab) and reversed the antiplatelet activity of ticagrelor in vitro (in human platelet-rich plasma) and in vivo (in a mouse model of acute surgery) . MEDI2452 requires further investigation to assess its potential role in reversal of the antiplatelet effects of ticagrelor in humans. Platelet-rich plasma may reverse the antiplatelet effects of clopidogrel , although a more recent study demonstrated that autologous platelet transfusion did not reverse the effects of clopidogrel 24 h after the final dose . A study of the effect of autologous platelet transfusion in healthy volunteers treated with ticagrelor was recently completed (ClinicalTrials.gov study ID: NCT01744288) and the results are to be published. The clinical characteristics of ticagrelor may be related to its effect not only through the P2Y12 receptor but also through adenosine-mediated action . Using an in vitro model with recombinant Madin–Darby canine kidney cells, at concentrations of clinical relevance, ticagrelor—and, to a lesser extent, its metabolites—inhibited cellular adenosine uptake in cells expressing equilibrative nucleoside transporter-1 (ENT-1) . In the same study, the active metabolites of clopidogrel and prasugrel did not display any significant inhibition of ENT-1. This finding was supported by a clinical study examining coronary blood flow velocity (CBFV) in healthy men receiving ticagrelor or placebo, which showed that ticagrelor enhanced adenosine-induced CBFV and the sensation of dyspnoea . The inhibition of ENT-1 by ticagrelor has been reported from other studies and has been recently reviewed . ENT-1 inhibition protects adenosine from intracellular metabolism, thereby increasing its concentration and biological activity, providing potential benefit for the heart in ischaemia–reperfusion injury . In addition to the ENT-1-mediated effects of ticagrelor, a comparison of the effect of clopidogrel and ticagrelor on myocardial infarct size in rats showed that ticagrelor, but not clopidogrel, reduces myocardial infarct size . The effect of ticagrelor was dependent on adenosine-receptor activation with downstream upregulation of endothelial nitric oxide synthase and cyclooxygenase-2 activity. An in vitro investigation of the effects of ticagrelor and the clopidogrel-active metabolite showed that ticagrelor has an anticoagulant and anti-inflammatory profile and enhances endothelial nitric oxide synthase activation . These effects appeared to be mediated independently of P2Y12 or adenosine receptors. Ticagrelor inhibited ADP-induced platelet aggregation in a dose-dependent manner in healthy volunteers receiving single 30–400 mg doses, with doses less than 30 mg having no significant inhibitory effect . When given twice daily (50–300 mg), ticagrelor provides a consistently greater IPA than an equivalent single daily dose (100–600 mg) . In the study of single and multiple ascending doses of ticagrelor in Japanese and Caucasian healthy volunteers, a slightly greater exposure in Japanese versus Caucasian groups was reported, although pharmacodynamic responses in terms of IPA and bleeding time were similar between groups . In Japanese and non-Japanese Asian patients with stable CAD receiving ticagrelor (45 or 90 mg twice daily) or clopidogrel (75 mg once daily), IPA was dose dependent and was greater with ticagrelor versus clopidogrel. In a subset of Japanese patients, exposure to ticagrelor and its active metabolite, AR-C124910XX, increased dose proportionally (Fig. 3) . Further comparator studies of ticagrelor versus clopidogrel in Hispanic and African-American patients reported similar results [44, 45]. Clinical trials report poorer outcomes for diabetic patients with ACS compared with patients without diabetes . The presence of diabetes does not appear to influence response to ticagrelor. Consistent with the full study population analysis reported above, subgroup analyses in Hispanic (AstraZeneca, data on file) and African-American  patients with diabetes also reported greater IPA with ticagrelor versus clopidogrel. In patients with stable atherosclerosis, greater IPA was observed for ticagrelor compared with clopidogrel . Higher doses of ticagrelor (100 and 200 mg twice daily, and 400 mg once daily) provided more effective IPA than ticagrelor 50 mg twice daily or clopidogrel 75 mg once daily at 2 h after initial dosing and at steady state. Furthermore, 4 h post-dosing at steady state, the greater IPA observed with the higher doses of ticagrelor compared with ticagrelor 50 mg twice daily or clopidogrel 75 mg was maintained . The PLATO study, a multicentre, double-blind, randomized trial of ticagrelor (180 mg loading dose, 90 mg twice daily thereafter) versus clopidogrel (75 mg once daily), in patients with ACS, reported no significant differences in overall major bleeding events (PLATO- and TIMI-defined bleeding), or fatal or life-threatening bleeding, or rates of CABG-related major bleeding, or bleeding requiring a transfusion between treatment groups . Compared with clopidogrel, rates of non-CABG-related major bleeding and fatal intracranial bleeding were higher with ticagrelor. For other types of fatal bleeding, rates were lower with ticagrelor versus clopidogrel. In the subgroup of ACS patients in PLATO who were undergoing CABG and who stopped taking antiplatelet therapy ≤1 to >6 days prior to surgery, there was no difference in CABG-related major bleeding between ticagrelor and clopidogrel . The ticagrelor prescribing information  and current guidelines [1, 5, 6, 7] recommend that ticagrelor is discontinued at least 24 h before urgent CABG [1, 5] and 3–5 days  or at least 5 days [1, 5, 6, 29] prior to planned CABG. A substudy of the PLATO trial showed greater IPA with ticagrelor versus clopidogrel, with separation of profiles reported within the first hours of treatment and also during maintenance therapy . Consistent with the results of the PLATO study, in the DISPERSE-2 study of ticagrelor versus clopidogrel in patients with non-ST-segment elevation ACS, there was no difference between groups in major bleeding rates . Although not significant, a trend for a reduction in MI rates was seen for ticagrelor versus clopidogrel in the DISPERSE-2 substudy. In a further study of 50 patients with ST-segment elevation MI (STEMI), ticagrelor and prasugrel effects on platelet reactivity were not significantly different . Interestingly, in this study, morphine use was associated with delayed activity of ticagrelor and prasugrel. Some studies have indicated that the onset of action of ticagrelor with respect to IPA is slower than previously suggested  and that there are pharmacodynamic differences compared with prasugrel [78, 79]. The use of ticagrelor suspension (crushed tablets) has the potential to increase the rate of onset of action. In the randomized MOJITO (Mashed or Just Integral Pill of Ticagrelor) study in STEMI patients, crushed ticagrelor tablets resulted in an earlier onset of IPA compared with standard integral tablets . The randomized LIQUID (Oral Crushed and Dispersed Ticagrelor 180 mg Compared to Whole Tablets of Equal Dose in STEMI Patients Undergoing Primary PCI: A Pharmacodynamic and Pharmacokinetic Comparison) study (ClinicalTrials.gov study ID: NCT02046486) is an extension of the MOJITO study and includes detailed pharmacokinetic and pharmacodynamic assessments. RESPOND (Response to Ticagrelor in Clopidogrel Non-responders and Responders and Effect of Switching Therapies) was a two-way crossover study of 98 patients with stable CAD . At the study start, all patients received a single 300 mg clopidogrel dose and ADP-induced platelet aggregation was assessed prior to dosing and at 6–8 h post-dose. If the absolute change in platelet aggregation was ≤10 %, patients were classified as non-responders. In study period 1, clopidogrel non-responders and responders were randomized 1:1 to receive aspirin and ticagrelor (180/90 mg once daily) or clopidogrel (600/75 mg once daily) . In study period 2, all non-responders and half of the current responders switched treatment (i.e. from clopidogrel to ticagrelor or from ticagrelor to clopidogrel), and the others remained on their period 1 treatment. The study reported rapid enhancement of platelet inhibition in clopidogrel responders as well as non-responders after a switch to ticagrelor. Absolute IPA increased by 26.4 % in patients who switched from clopidogrel to ticagrelor treatment. In contrast, switching to clopidogrel resulted in a 24.5 % reduction in absolute IPA. Cangrelor, which binds to the same site on the P2Y12 receptor as ticagrelor, is approved in the EU for the reduction of thrombotic cardiovascular events in adult patients with CAD undergoing percutaneous coronary intervention who have not received an oral P2Y12 inhibitor prior to this procedure and in whom oral therapy with P2Y12 inhibitors is not feasible or desirable . Because of its very short half-life, intravenous cangrelor leads to rapid and extensive IPA with almost full recovery of platelet activity within 60–90 min of withdrawal . Potentially, in some clinical situations, patients may switch between ticagrelor or clopidogrel to cangrelor and vice versa. In a study in dogs, various switching regimens of ticagrelor, clopidogrel and cangrelor were investigated . The study showed that 2 h after clopidogrel, IPA was reduced from 69 to 39 % when clopidogrel was given after cangrelor infusion versus clopidogrel alone. When clopidogrel was dosed 3 h after ticagrelor, IPA was reduced from 68 to 38 % at 24 h versus clopidogrel alone. An interaction was not seen when clopidogrel was dosed 7 h after ticagrelor. No pharmacodynamic interaction occurred between ticagrelor and cangrelor. The pharmacodynamic effects of switching from cangrelor to ticagrelor, and from ticagrelor to cangrelor, were assessed in patients with stable CAD . Patients received a bolus plus a 2-h infusion of cangrelor and also 180 mg of oral ticagrelor at 0.5 or 1.25 h. Following this schedule, patients received ticagrelor (90 mg twice daily) for 6 or 7 days, during which time pharmacodynamic effects were assessed on day 5 before, and during, a bolus plus 2-h infusion of cangrelor. Pharmacodynamic assessments included light transmission aggregometry, a VerifyNow P2Y12 assay and platelet activation. The study concluded that the pharmacodynamic effects of cangrelor were not attenuated by ticagrelor. In addition, the pharmacodynamic effects of ticagrelor were preserved when ticagrelor was given during infusion of cangrelor. These data suggest that ticagrelor can be administered before, during or after cangrelor treatment without apparent treatment interaction. Switching from ticagrelor to prasugrel has also been evaluated in 110 patients with stable CAD . An initial loading dose of ticagrelor (180 mg) was administered, followed by a 3- to 5-day run-in phase of ticagrelor 90 mg twice daily. Patients were then randomized to continue ticagrelor or to switch to prasugrel 10 mg once daily with or without a 60 mg prasugrel loading dose. Switching from ticagrelor to prasugrel was associated with an increase in platelet reactivity—this effect was partially mitigated when a 60 mg loading dose of prasugrel was administered. Inadequate antiplatelet effects are observed in up to one third of patients receiving clopidogrel [87, 88, 89]. Reasons for this variation in response may be the presence of polymorphisms in genes such as CYP2C19 and ABCB1. In the pooled analysis of the RESPOND and ONSET/OFFSET studies , CYP2C19 genotype influenced the antiplatelet activity of clopidogrel, whereas the antiplatelet activity of ticagrelor was not associated with CYP2C19 genotype. Ticagrelor exhibited lower platelet reactivity (i.e. less platelet aggregation) than clopidogrel for all assays used in the study irrespective of CYP2C19 genotype. The ABCB1 genotype did not significantly influence platelet response in either the ticagrelor or clopidogrel treatment groups. A large genetic substudy was performed as part of the PLATO trial . This substudy showed that CYP2C19 and ABCB1 polymorphisms were independent of the lower rates of cardiovascular death, MI or stroke observed in patients treated with ticagrelor compared with clopidogrel. Rates of total major bleeding were similar between the ticagrelor and clopidogrel groups in this substudy. A genome-wide association study (GWAS) of patients from the PLATO study identified single nucleotide polymorphisms (SNPs) affecting cystatin-C levels . However, the composite clinical outcome of first occurrence of MI or cardiovascular death within the first year was not associated with cystatin-C genotype. A further GWAS study in the PLATO trial showed that plasma levels of ticagrelor and AR-C124910XX were associated with a SNP in the solute carrier organic anion transporter family member 1B1 (SLCO1B1) gene . This SNP is in linkage disequilibrium with a functional variant that leads to decreased organic anion transporting polypeptide 1B1 (OATP1B1) activity. In the same study, plasma ticagrelor levels were associated with two independent SNPs in the CYP3A4 region, and AR-C124910XX levels were associated with a SNP in the UDP-glucuronosyltransferase 2B7 (UGT2B7) gene. However, the effects on plasma ticagrelor and AR-C124910XX at each of these loci were small, and none were associated with clinical outcomes. The pharmacokinetic and pharmacodynamic profiles of ticagrelor are unique. Unlike other currently available antiplatelet agents, ticagrelor does not require metabolic activation and it binds rapidly and reversibly to the P2Y12 receptor. Patients with ACS represent broad populations who often have comorbidities and are likely to be taking several different classes of drug. Exposure to antiplatelet agents as measured by pharmacokinetic studies may vary in different populations. Understanding the pharmacological profile of oral antiplatelet agents is important to avoid drug–drug interactions and to provide optimal dosing. This review has summarized what is currently known about the pharmacokinetic, pharmacodynamic and pharmacogenomic profiles of ticagrelor. Studies in healthy volunteers showed that dose adjustments for ticagrelor were not required on the basis of age, gender or ethnicity. Severe renal impairment and mild hepatic impairment also do not necessitate dose adjustments. Pharmacokinetic data are not currently available in patients with moderate and severe hepatic impairment or those on renal dialysis, and use of ticagrelor in patients with severe hepatic impairment is contraindicated. Exposure to ticagrelor is higher in Japanese and Chinese populations versus Caucasians; however, these differences are not considered to be clinically relevant and dose adjustments are not required. African-American and Hispanic populations show a ticagrelor pharmacokinetic/pharmacodynamic profile similar to that of Caucasians. The clinical relevance of the increased plasma concentrations of ticagrelor observed at 0.5 and 1 h with use of crushed tablets has yet to be shown. Drug interaction studies show that ticagrelor should not be co-administered with strong CYP3A inhibitors or inducers, and use with statins at doses greater than 40 mg should be avoided. Patients receiving P-gp-dependent drugs with a narrow therapeutic range, at the same time as ticagrelor, should be monitored appropriately. Current data show that proton pump inhibitors (metabolized by CYP2C enzymes) are unlikely to have any significant pharmacokinetic interaction with ticagrelor. The non-P2Y12 receptor actions of ticagrelor warrant further investigation, in particular the possible beneficial effects on cardiac perfusion. Current data suggest that, if necessary, patients who are not responsive to clopidogrel can be switched directly to ticagrelor with an increase in IPA. In contrast, switching from ticagrelor to clopidogrel is associated with a reduction in IPA. Genetic variations appear to influence response to clopidogrel. However, there is currently no evidence to show that this is true for ticagrelor. Ongoing studies will provide additional insights into the pharmacology of ticagrelor and will help support individualized P2Y12 inhibitor treatment, in line with guideline recommendations. Renli Teng is an employee of AstraZeneca. Medical writing assistance was provided by Angela Rogers (Gardiner-Caldwell Communications, part of the KnowledgePoint360 Group, an Ashfield company, Macclesfield, UK), and assistance with revising the paper in response to journal comments was provided by Jackie Phillipson (Zoetic Science, part of the KnowledgePoint360 Group, an Ashfield company, Macclesfield, UK); this support was funded by AstraZeneca. AstraZeneca LP. Brilinta (ticagrelor) tablets. Approved prescribing information. Updated Mar 29, 2013. Available at: http://www1.astrazeneca-us.com/pi/brilinta.pdf. Accessed 24 Mar 2015. Sanofi, Bristol-Myers Squibb. Plavix (clopidogrel bisulfate) tablets. Approved prescribing information. Updated Dec 2013. Available at: http://packageinserts.bms.com/pi/pi_plavix.pdf. Accessed 27 Mar 2015. Eli Lilly and Company. Effient (prasugrel) tablets. Approved prescribing information. Updated Nov 2013. Available at: http://pi.lilly.com/us/effient.pdf. Accessed 27 Mar 2015. The Medicines Company UK Ltd. Kengrexal (cangrelor) powder. Patient information leaflet. Updated Apr 8, 2015. Available at: https://www.medicines.org.uk/emc/medicine/30245. Accessed 13 Apr 2015.